Late Simon goal seals win for Nigeria - SABC News - Breaking news, special reports, world, business, sport coverage of all South African current events. Africa's news leader. Victory means Nigeria have 13 points and are sure to top the group. South Africa have nine, Libya seven and the Seychelles one. Nigeria needed 90 minutes to quell the Seychelles and a 3-1 Africa Cup of Nations qualifying home victory on Friday. Nigeria took the lead, but the Indian Ocean islanders equalised before half-time and trailed by only one goal until the final minute when Moses Simon put the outcome beyond doubt. 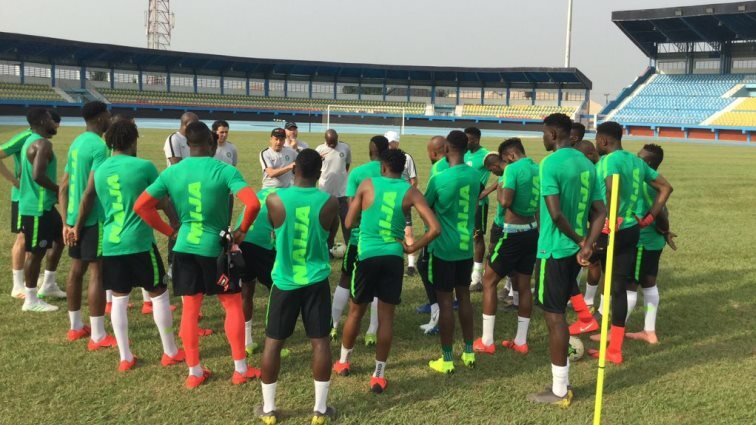 The match in southeastern town Asaba was a dead rubber as Nigeria had already qualified for the June 21-July 19 finals in Egypt and the Seychelles were doomed to finish last in the qualifying group. Who accompanies Nigeria to Egypt from Group E will be decided Sunday with South Africa needing a draw and Libya a victory when they clash in north Africa. Nigeria won 3-0 in the Seychelles last year and moved ahead on Friday when former Watford striker Odion Ighalo converted a 35th-minute penalty. Seychelles stunned the Stephen Keshi Stadium crowd four minutes before half-time when a fumble by goalkeeper Francis Uzoho allowed Rody Melanie to fire into the net. Henry Onyekuru nodded three-time African champions Nigeria into the lead again, punishing slack marking to nod home a cross on 50 minutes. Simon came off the bench to complete the scoring with a low shot that eluded goalkeeper Ian Han Kong at his near post. Meanwhile, Morocco clinched top spot in Group B by drawing 0-0 in Malawi and Equatorial Guinea triumphed 4-1 in Sudan to come third behind Senegal and Madagascar in Group A. This entry was posted on 22 Mar 2019,08:36PM at 8:36 PM and is filed under mobile-leadstory, Sport, News, Homepage Featured Story Slider. You can follow any responses to this entry through the RSS 2.0 feed. Both comments and pings are currently closed.